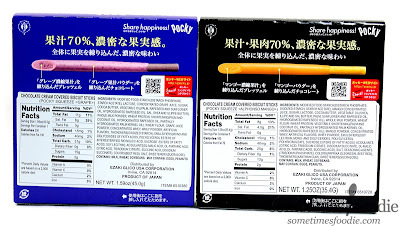 It might be hard to tell in photos, but these are half sized boxes that contain mini Pocky sticks. For something so small, the packaging sure is stylish! The cardboard boxes have a high gloss finish, beautiful food imagery, and a fairly luxe feel. They even photographed beautifully! 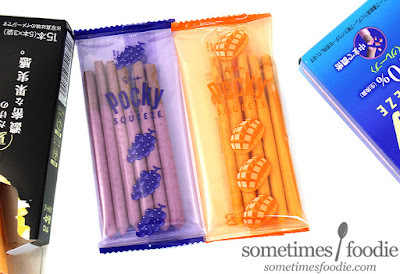 So far, this packaging as me falling in love with Pocky all over again, but what about the flavors? 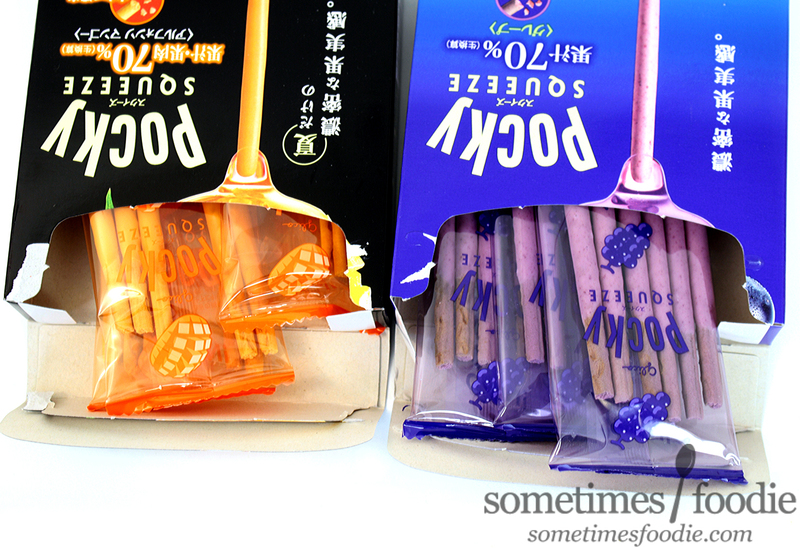 Inside each box are three packets of mini Pocky sticks each containing six pieces. The packets are made of clear plastic with printed images of the corresponding fruits done in flavor-matching ink. So fancy! Upon further inspection, the bread sticks themselves are colored too! Impressive. I've only had a handful of other Pocky flavors that have done this, and the monochromatic colors really make a strong visual impact. Once opened, each flavor has it's own strong, fruity, aroma. The grape smell really crisp and sweet, like concord grape gummies, and for something that is chocolate based, it lacks those creamy yogurt notes that a lot of white confectionery products have. What is this witchcraft? I guess that 70% fruit is really changing thing up here, because if I had to guess what this candy was based on the scent along, I'd think it was a grape chew or gummy. The mango flavor is also sweet, but it does have some creamy yogurty notes, so while it is very strong and gummy-like in it's own way, it's more like the mango yogurt chews from Trader Joe's. It's slightly less impressive in terms of crispness, but still, very bold and surprisingly authentic. So, they smell great (I could sniff these all day!) but how do they taste? 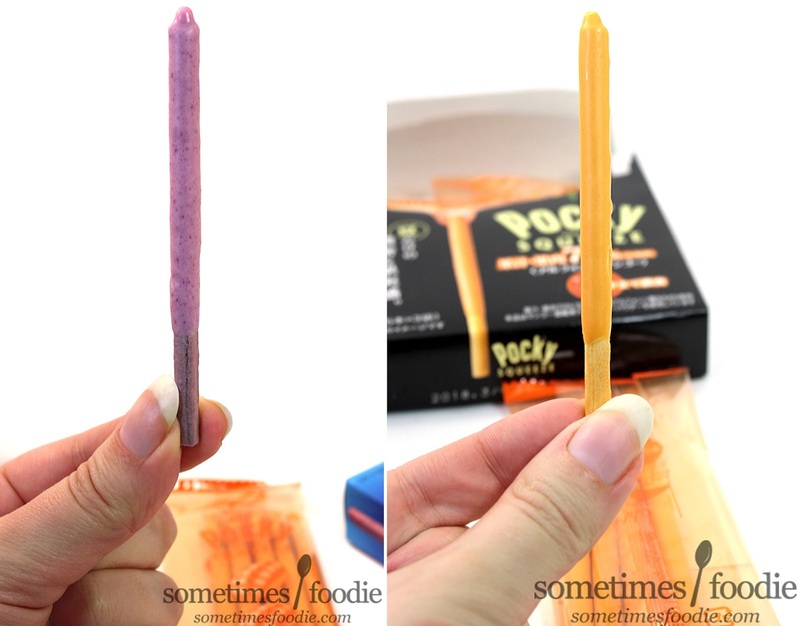 Since the sticks are colored, and likely flavored, I decided to try it on it's own and then try the portion with the flavored coating. First up, the orange-colored mango stick. 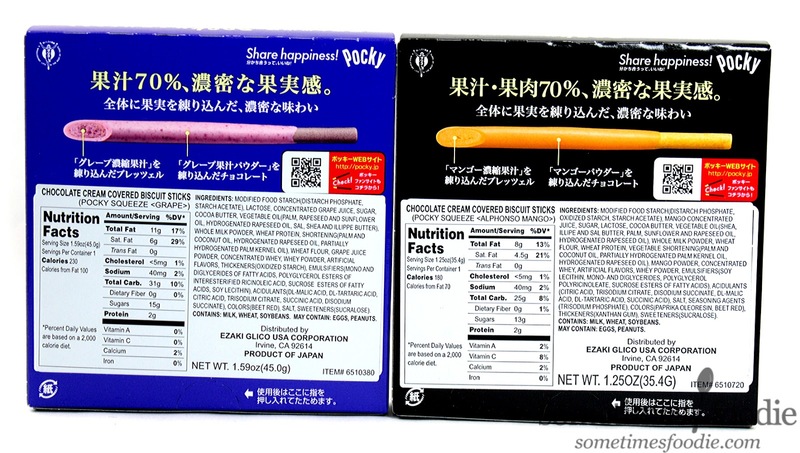 Initially the stick tastes bland and biscuit-like, as always, but when chewed the core does have some flecks of fruity flavoring. Is it flecks of freeze-dried fruit? I'm not entirely sure, but the stick sure does taste like mango...and saltine crackers, but I can taste Mango and that's pretty awesome. The chocolate-coating has a creamy, mild, mango flavoring to it, almost like eating a spoonful of partially mixed fruit-on-the-bottom-style yogurt. It's creamy, and very mild. I'm shocked, I guess all the fruity flavoring is in the stick portion! Who knew! The grape stick started out very mild, but as I chewed it seems to have a fruit-flavored core as well. The grape flavoring was juicy and bright, but it was also mixed with that flour-y Pop-Tart-crust flavoring that all Pocky sticks have. Not bad at all, honestly, this tastes really fruity! The cream coated portion has a bit more bite this time around, tasting like cream and (oddly enough) grape skin. That's right, it has that slightly bitter taste that the skin of a grape has when you bite into it, and the core of the stick has this concord grape jelly flavoring that, when combined, gives you this bizarrely realistic grape flavoring. It's like, eating a concord grape Pop-Tart. It's way better than I thought it'd be, but I'm still trying to wrap my brain around it. 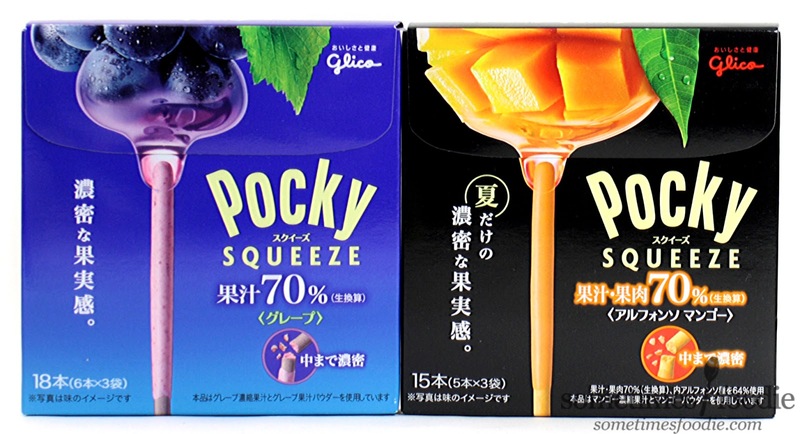 Both of these flavors are really great, but the grape is just so...mind boggling. How can it taste so juicy? It's like it has a jelly-like Pop-Tart filling...but it doesn't! I honestly believe them when they say there's 70% fruit in these things, because they taste fantastic! If you see them around, give them a try. I've never had such a refreshing tasting fruity biscuit, and I look forward to more Squeeze flavors in the future.